Far too much time has passed since my last birding trip and I've missed far too many good birds. Anyway, today I finally tried my luck again in the hope of finding my own good birds. My first try was the "Ochsenanger", a medium sized quarry pond 15 km north of Bamberg, where I haven't been for a long while. Regardless of this, the situation looked rather disappointing on the first glance, as the only birds of interest seemed to be some Gadwalls near the opposite shore. Fortunately, I decided to spend a bit more time here and walked to the hide at its west shore. This turned out to be a good idea, since I caught up there with a Meadow Pipit (quite rare at this time of the year) and a group of four "Northern" Bullfinches, more precisely with four individuals that uttered the strange "trumpet call". Always a delight to see this taxon. Leaving therefore the "Ochsenanger" not completely unsatisfied, I went to the neighbouring "Röckelein Baggersee", which normally is quite productive in the winter. This was already confirmed when I arrived, since a group of Common Gulls was feeding in the fields next to the quarry pond. 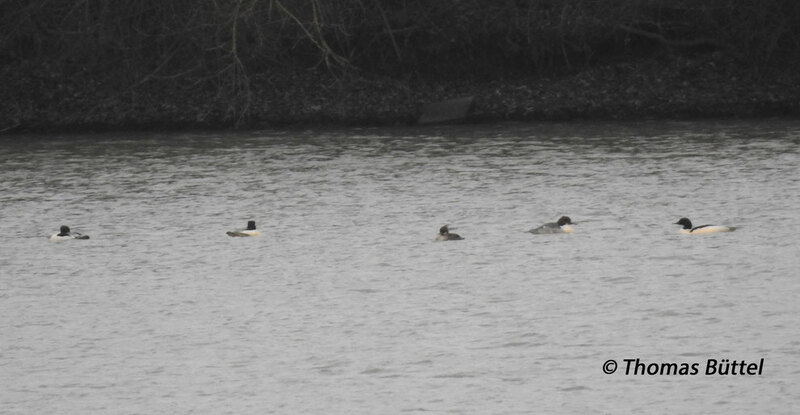 Despite of this good start, the lake held not too many birds, in fact just a couple of Tufted Ducks and Goosanders. Nevertheless, it was worth to scan the lake with the scope, as I detected also two Red breasted Merganser among the latter. Finally, already on the way back home, I made a small detour to the harbour of Bamberg, which is a good place for observing gulls. Fortunately, the number of Black-headed Gulls has risen since my last visit, which normally increases the chance of finding something good. This proved to be true, because I found along with another four Common Gulls a 1st winter Caspian and Yellow legged Gull. Definitely not bad for the season and the short duration of the visit. Let's see what comes next, when the temperature drops as predicted by the weather forecast.